"City Gate" redirects here. For the Israeli skyscraper, see Moshe Aviv Tower. A city gate is a gate which is, or was, set within a city wall. With increased stability and freedom, many walled cities removed such fortifications as city gates, although many still survive; albeit for historic interest rather than security. Many surviving gates have been heavily restored, rebuilt or new ones created to add to the appearance of a city, such as Bab Bou Jalous in Fes. With increased levels of traffic, city gates have come under threat in the past for impeding the flow of traffic, such as Temple Bar in London which was removed in the 19th century. Greece: Lion Gate in Mycenae, 13th century B.C.. The entrance of Machu Picchu. 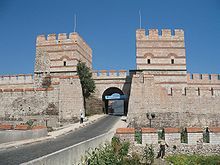 Wikimedia Commons has media related to City gate. This page was last edited on 9 February 2019, at 07:53 (UTC).